People really love Chick-fil-A. Even despite fresh pushback over its history of being anti-LGBT, the fried chicken sandwich peddler was recently named America's favorite fast-food restaurant for the third year in a row, and it's on track to become the third biggest fast-food chain in the US. Its dominance will likely only continue if it keeps adding spicy chicken to its menu. 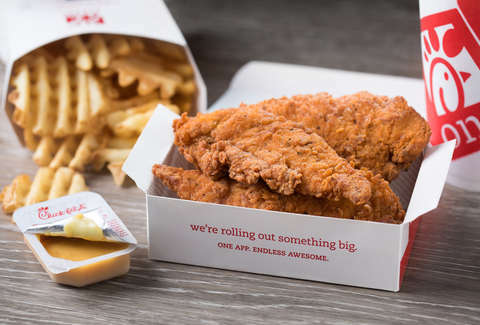 So, great news for politically ambivalent pepperheads: Phoenix, Arizona will be the next city to get Chick-fil-A's all-new Spicy Chick-n-Strips. The Strips debuted last fall in Philadelphia, Central Texas, and South Texas as part of a taste test, and this is that test's next phase. As you've probably deduced, these are similar to the Chick-n-Strips currently on the menu, but they're "seasoned with a spicy blend of peppers." The chain describes them as "a combination of two customer favorites, the original Chick-fil-A Chick-n-Strips and the Spicy Chick-fil-A Chicken Sandwich." Considering the original strips and the spicy chicken sandwich are Chick-fil-A's ninth and seventh most popular menu items, respectively, combining them into a new offering makes a whole lot of sense. They'll be available in 3- and 4-count options. The strips will make their debut in Phoenix on August 25 and will continue to be served in the places they're currently on the menu. If this goes well, there's a good chance they'll head nationwide. Don't mess this up for the rest of us, Phoenix.